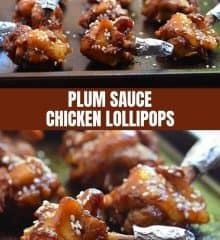 Plum Sauce Chicken Lollipops are super fun and tasty appetizers that are sure to be a hit with the crowd. 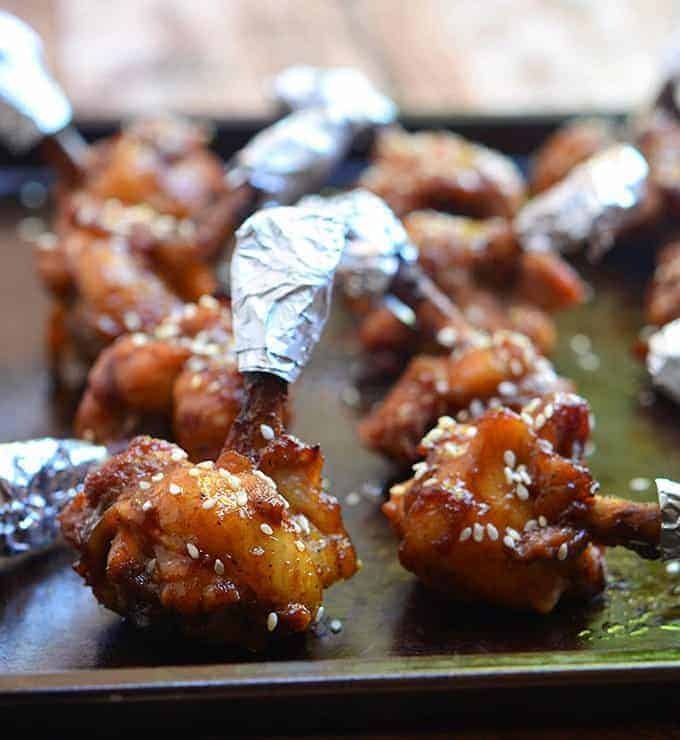 Baked in a sweet and savory sauce, they’re finger-licking, lip-smacking addicting! 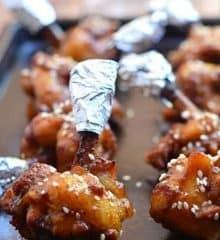 The first time I tried chicken lollipops at a Filipino restaurant I frequent in Cerritos, I thought they were a 100% Pinoy concept. 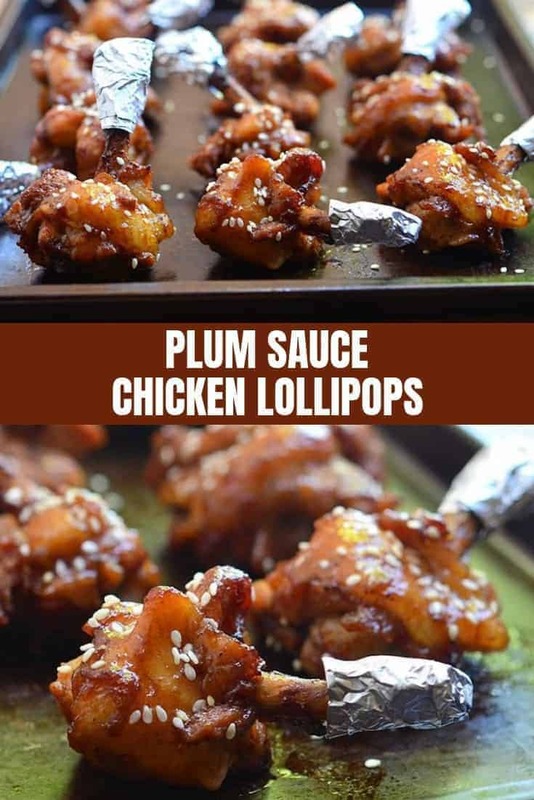 We, Filipinos, are an ingenious lot and something like a chicken segment shaped into a lollipop didn’t seem to me all that far out for our creativity. 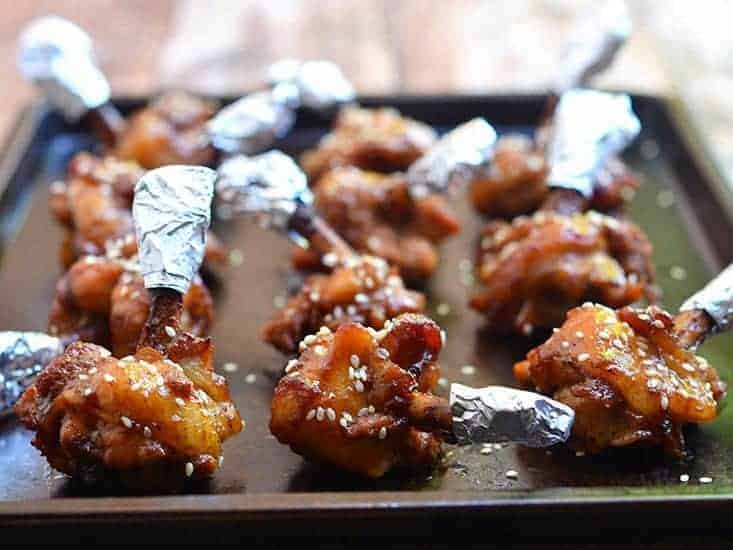 However, I found out today in my research online that these frenched drumettes originated from the Indian Chinese cuisine where they are popular as hors-d’oeuvres. But original idea or not, they’ve become a regular mainstay in the Filipino food scene and have been heavily adapted to meet local tastes. 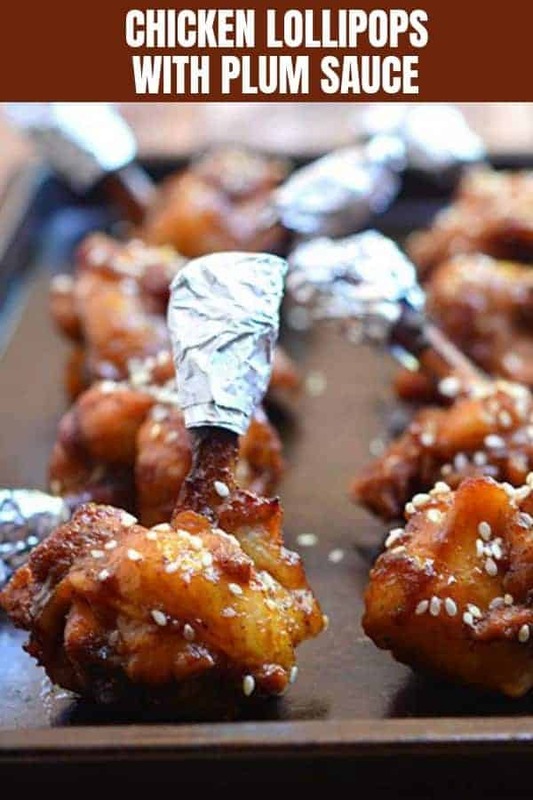 Chicken Lollipops are chicken winglets or legs wherein the meat is cut from the bone end and pushed down to resemble a lollipop. They’re traditionally breaded with a seasoned batter and deep-fried in hot oil until crispy. The exposed bone is sometimes wrapped in aluminum foil to allow easy handling. 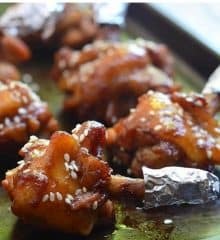 In this recipe, I skipped the breading and the frying and instead, marinated the drumettes overnight in a sweet, salty, and slightly spicy plum sauce mixture and then baked them in a 350 F oven to juicy perfection. 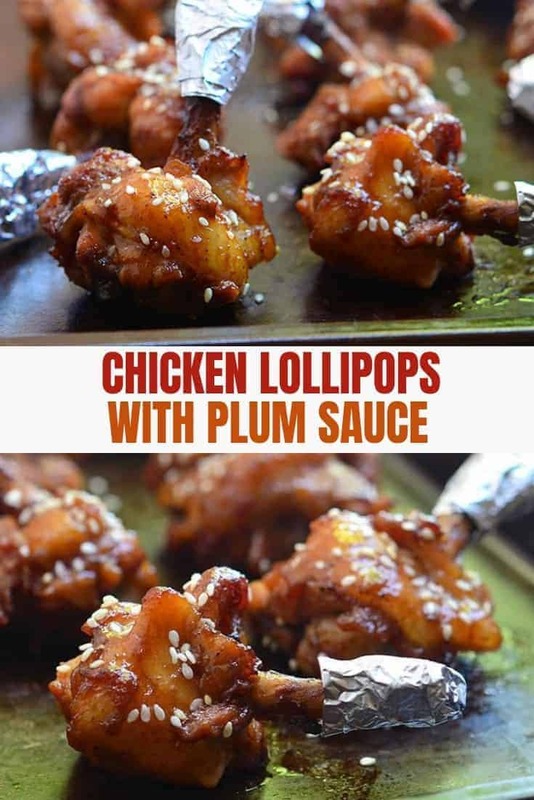 You can also grill the chicken at 350 F medium heat or smoke them at 250 F until a thermometer inserted in the thickest part of the meat reads 165 F. Any way you cook these plum sauce chicken lollipops, they’re finger-licking, lip-smacking awesome! 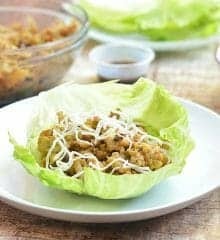 Skipping the breading and baking instead of deep-frying definitely make these fun appetizers more waist-friendly with calories clocking it at 282 Kcal and fat at 13 gms per serving. 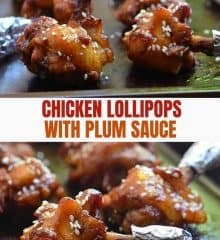 Plum Sauce Chicken Lollipops are super fun and tasty appetizers that are sure to be a hit with the crowd. 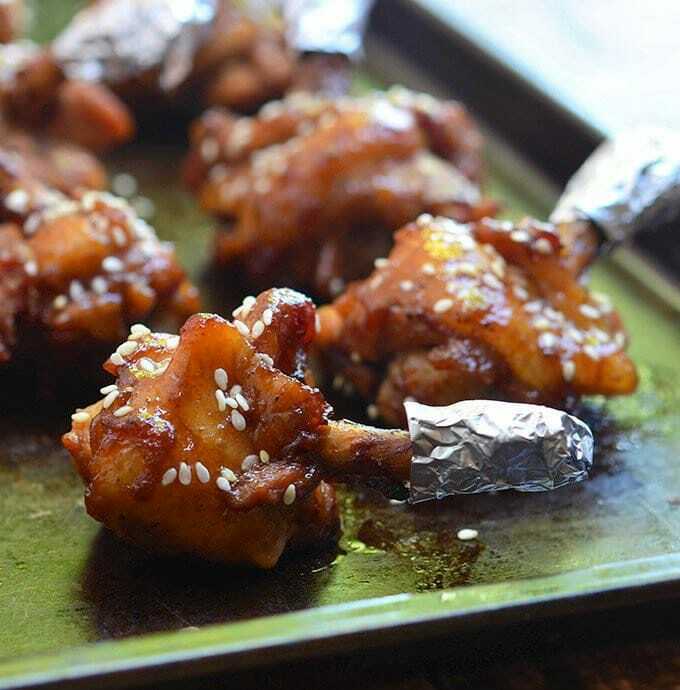 Baked in a sweet and savory sauce, they're finger-licking, lip-smacking addicting! With a knife or scissors, cut the skin and tendon around the base of chicken drumette. Holding the exposed bone of the drumette, gently push the meat all the way down the opposite end, forming a knob of meat like a "lollipop". Repeat with remaining drumettes. In a bowl, combine plum sauce, calamansi or lemon juice, soy sauce, honey, rice vinegar, chili oil, ginger, garlic, salt, and pepper. Whisk together until well-blended. 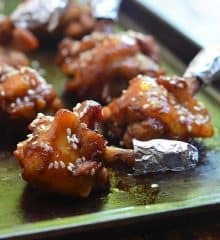 Add frenched drumettes to plum sauce mixture and marinate in the refrigerator for at least 4 hours or overnight for best results. Drain chicken, reserving marinade. Wrap the exposed bone of each drummette with a strip of aluminum foil. In a saucepan over medium heat, bring marinade to a boil for about 5 minutes or until completely heated and reduced. On a lightly greased baking sheet, arrange chicken in a single layer. 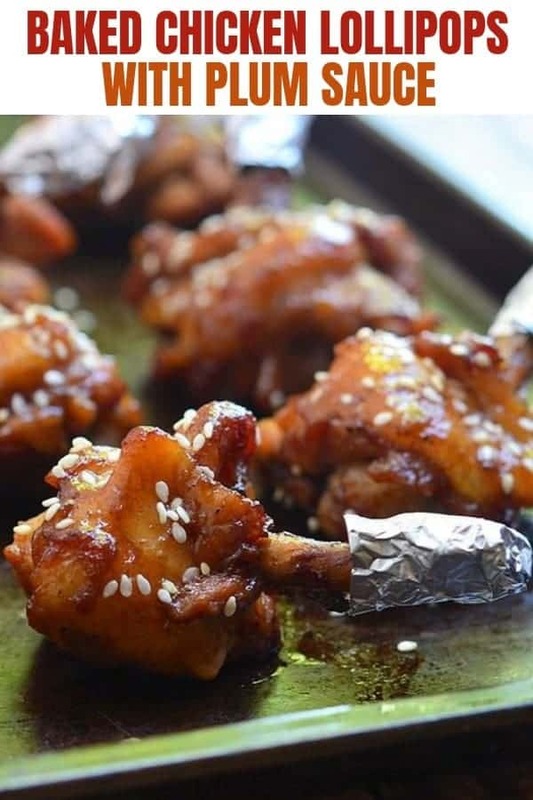 Bake in a 350 F oven, basting every 10 minutes with marinade, for about 30 to 35 minutes or until browned and thermometer inserted in the thickest part of the meat reads 165 F.
Remove from oven and sprinkle with sesame seeds. Serve hot.